In introducing eight new eucharistic prayers, "Common Worship" has focused fresh attention on the most central act of Christian worship. 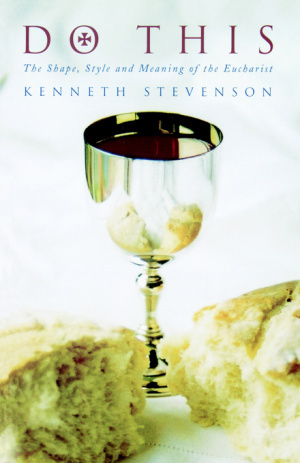 This text offers a wealth of information on both the words and actions of the Eucharist. ;Part one focuses on the content of the Eucharist, from the opening greeting to the final blessing and dismissal. Each stage of the service is explored from a biblical and historical perpective and readers discover how the Eucharist has evolved from the days of the Early Church. ;Part two focuses on the actions of the Eucharist: the posture and movement of the celebrant and participants, ceremonial, symbolism, the role of memory, essentials and variables in the rite. ;Part Three explores the eight different Eucharistic prayers of "Common Worship", their distinctive styles, provenance, theological features and pastoral uses. Do This: The Shape, Style and Meaning of the Eucharist by Kenneth Stevenson was published by Canterbury Press in January 2002 and is our 25828th best seller. The ISBN for Do This: The Shape, Style and Meaning of the Eucharist is 9781853114649. Be the first to review Do This: The Shape, Style and Meaning of the Eucharist! Got a question? No problem! Just click here to ask us about Do This: The Shape, Style and Meaning of the Eucharist.